We called in celebrity manicurist Gina Eppolito (who tends the tips of Sarah Jessica Parker, Kelly Ripa, Tina Fey and more) to create these Valentine’s-inspired nails that are simple to DIY. For this manicure, you’ll need a package of imitation gold leaf sheets (available for less than $10 at art stores), a wood cuticle stick, red polish, clear topcoat and a black nail art polish with a skinny brush. Start by applying a base coat, then paint nails red. After 10 minutes, once the red polish is almost dry, paint on the hearts, varying the sizes and their position on each nail. Use the skinny nail brush to draw a “V” and fill in the shape to create the heart. Use the wood cuticle stick to break off bits of gold leaf. (Gina recommends doing this on a smooth, hard surface.) Dab a small drop of clear polish on each heart. Let dry for one minute until polish is tacky, then use the stick to place bits of gold leaf at the center of each heart. The final product: a heart of gold. If you’ve got a ripped pair of fishnets lying around, grab ‘em. You’ll also need a contrasting polish (we used metallic red), brush-on nail glue and cuticle scissors. Start by applying a base coat and painting nails in your chosen shade. Cut 10 pieces of stocking material, each one slightly larger than your nail. Working on one nail at a time, brush on the glue and, while it’s still wet, stick on the fishnet piece. You’ll want to stretch the stocking a bit so the holes are visible - the wet glue gives you some room to adjust. Once you’ve applied the fishnet material to each nail, let the glue dry for a few minutes, then use cuticle scissors to trim the excess material away from each finger. Ta da! We love how this design creates a velvety 3D effect that reminds us of snakeskin. For this design, you’ll need two contrasting polish shades and a skinny brush. We started by painting nails silver. 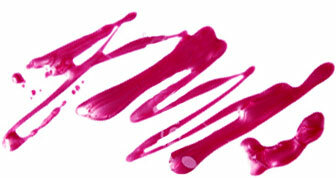 Once your base color is dry (about 10 minutes), use the skinny brush to paint lips in your second color. Gina’s tip: Paint an “M” shape for the top lip, then connect the bottom with a “C” shape. Mwah! The smooch-worthy final product is our Valentine to nail art. For more info on Gina Eppolito’s work, visit ginails.com.